Once a month a group of us endeavour to get out into the marvellous Scottish countryside and climb something. We usually try to do a Munro or two (at the rate we're going we'll have them all done sometime in the next century). We're definitely walkers - anything involving ropes and crampons is right out. Some of us are, ahem, more fit than others. Walking like an Egyptian from Loch Earn to Loch Lubnaig via Stuc a’ Chroin. With Mike, Scott, Arlene, Steves P and L and our special Egyptian guest, Llew. Tiny, Moss and Stella were the hounds. Weather was HOT (though not by Egyptian standards, we understand). Up Ben Vorlich, the other one – near Loch Lomond. 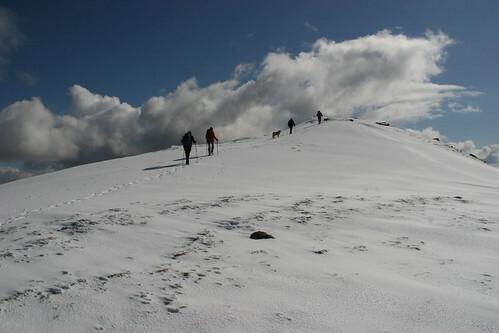 Dodgy start to the weather but things brightened up considerably as we approached the summit. Mike, Scott, Steve L, Steve P, Wendy were the humans. Stella and Tiny were the dogs. An illustrated talk by Mike Lewis, Sat Feb 20th at 19:30, at the Crieff SDA Church. Retiring Collection for Child India. It’s been a while since we posted pics from a walk. Mainly this is because we didn’t actually go out much – the weather hasn’t been too good on the days we set aside for a hill walk. Anyway – the weather today was superb. Cold and clear. We set off for Glencoe without a clear idea of where we’d go. We ended up atop Stob Na Doire, the middle peak of the Buachaille Etive Mòr ridge. A quick trip up the classic Glencoe hill, Buachaille Etive Mòr. We didn’t get started until 12:30 but made the summit in under 2 hours (which is quick for us…). Only got soaked once and thankfully the top was clear so we could see something. Bob Rodd came with us this time – and this was only his second ever Munro. Not that he’s competitive or anything – but he’d like us to note that he reached the summit first. Abandoned due to the weather. The trouble with the hills in Scotland is the names. I go on a hill walk, consult the map, climb a few hills, walk a ridge and by the time I get home I can’t remember the name of anything we climbed. Oh well. We walked the ridge south of Balquidder, overlooking Lochs Doine and Voil. Steve P, Steve L. Mike, Jen P were the humans, Mabel and Tiny were the dogs. Steve P, Steve L, Llew and Tiny The Dog. Our original plan was to head to Glencoe but the weather in the west was a bit dreich so we stayed closer to home and went up two summits near Killin, Creag Mhor (1048m) and Beinn Heasgarnich (1076m). 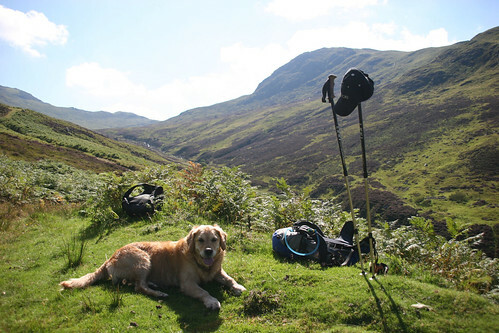 Mike, Steve L, Wendy – her last climb with us – did the two summits along with Tiny The Dog. Jen and Etien P did the first (Creag Mhor) with Mabel the Hound. 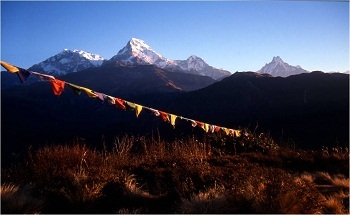 “The View from Kala Patar” – an illustrated talk by Mike Lewis describing his winter trek in the Khumbu Himalaya. Stunning mountain photography and amusing anecdotes will make this a memorable evening. Come and join us! A fantastic day on the Buachaille Etive Mor ridge. After ‘the Buckle’ last month we’re keeping things a bit flatter for the July trip. We’re going canoeing! Contact Steve Peacock for details. The plan was to go for Cairngorm, Ben Mheadhoin and Ben MacDui but it looks like the weather on the east side of Scotland isn’t going to be good. Meet at Mike’s home ready for an 08:30 departure (please note earlier start than usual). Please confirm participation with Mike beforehand (01764 655327). Meet at Mike’s home bright and early at 8:30am. Destination will depend on the weather. This is a low level family walk in Strathyre, 10:00am – 4:00pm Contact Mike on 01764 655327 or mike@scotmagic.co.uk for details.